I’ve never been a big fan of the Outer Banks of North Carolina as a whole, at least not the section most people visit, which includes Kitty Hawk, Kill Devil Hills, and Nags Head. Too busy, too crowded, and too much like one giant beach strip mall. If you’re looking for a little more serenity on the shore, head north to Corolla. Yes, there has been a boom in beach house building up here in recent years, but the area has a decidedly quieter feel as in no monster mini-golf parks, giant beach tourist traps, and endless streams of beachfront chain hotels. The beaches are quieter, too. You’ll likely have to rent a house if you want to stay in Corolla, as other lodging options are scarce with the exception of the Inn at Corolla Light. But avoid Brindley Beach vacation rentals like the plague…unless you like staying in a house with dog hair stuck in the carpet and black grease caked on the dining room chairs. Housekeeping is not their specialty. Take advantage of Vacation Rentals by Owner or some other source where you can rent directly from the homeowners and not have to go through a rental agency. 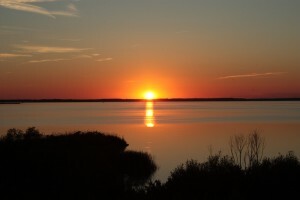 And if you go in the shoulder or off season, like spring or early fall, you can get a substantial house rental for half the price of the summer season and still enjoy fine weather….and gorgeous sunsets year-round.